It is a wonderful feeling to be able to add value to others and sometimes with pleasure we occasionally support charities or individuals that connect with us. Recently. Chris had the opportunity to talk about ‘The Power To Get Things Done (Whether You Feel Like It Or Not’ at ‘The Big House’ in London. The Big House works with young people who have been through the care system and are finding life difficult. Their inspirational founder Maggie Norris and her team are committed to unlocking their members’ potential and enabling them to lead positive and fulfilling lives. 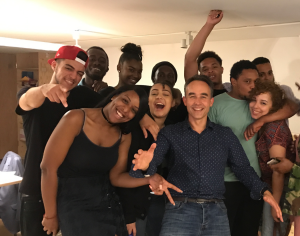 The Big House provide a platform for young people to participate in the making of theatre and to have their voices heard. In fact, 30 of their members have provided the acting cast for an incredible hard hitting movie that fingers crossed will be hitting our screens in the next year or two. Chris was completely blown away by the energy and enthusiasm of many of the young people. Also, saddened to hear of many of their terrible stories. Stories that made you appreciate just how fortunate most of us are and the power of the human spirit to rise above. Also, how much potential lies in young people who may not have the start that we hope for in life. Here is a photo of a few of the students who stayed behind after the speech. We can learn so much from their energy, vitality and cheeky sense of humour! To find out more about The Big House go to http://thebighouse.uk.com.